A thick hemp rope, a system of blocks and two wooden turnstiles moved by... walking workers. The crane’s medieval mechanism lifting 4-ton loads to a height of 11 metres was also used to install masts. 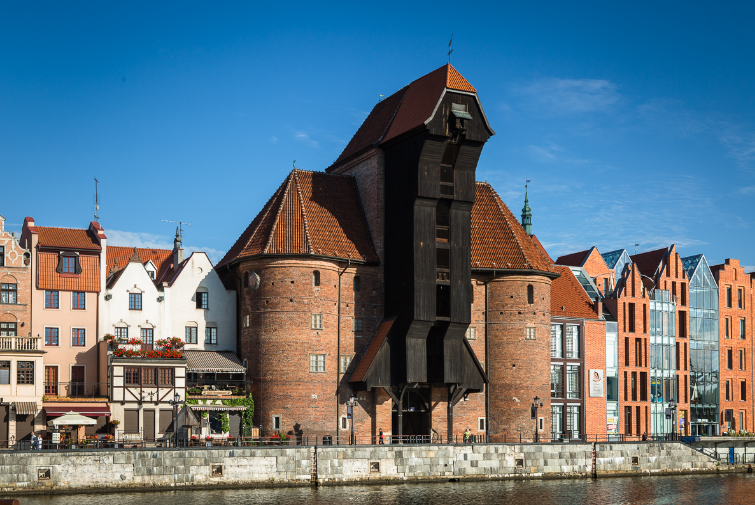 Located on the Motława River, Gdańsk’s most characteristic monument is the largest medieval port crane in Europe and at the same time a fortified water gate with two huge brick towers, once protecting the city from the side of the harbour. 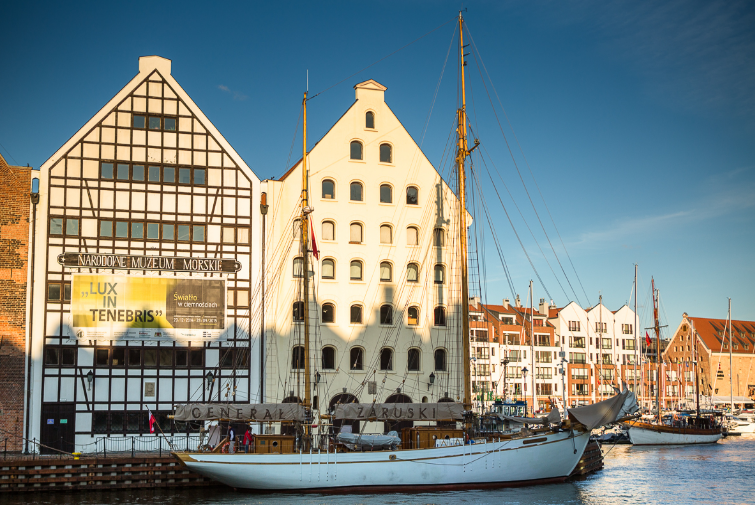 Now the majestic Crane, as a great example of historic port buildings, a witness of the powerful Hanseatic Gdańsk, called the granary of Europe, is the perfect setting for exhibitions of the National Maritime Museum. Its headquarters are also situated on the other side of the Motława River on Ołowianka Island. Ołowianka Island next to Granaries Island was an important part of the historical port during its greatest period of prosperity. Seven granaries were located there. Currently within the granaries “Panna”, “Miedź” and “Oliwski” as well as “Mała” and “Duża Dąbrowa” that were built later is located the headquarters and exhibition halls of the National Maritime Museum, considered to be one of the finest of its kind in Europe. Among the exhibits presented one can see: port navigation, techniques of reloading goods, what a merchant trading office and middle-class salon looked like, as well as the workshops of sailmakers, ship carpenters and ropemakers. The historic walls also conceal Poland’s only permanent exhibition of maritime paintings. The exhibition shows the history of diving and the most interesting archaeological sites in Poland and the world. It includes diving equipment: suits, devices and different types of diving bells that were used to explore the seabed. Some of the world’s most famous archaeological sites presented in the exhibition are shipwrecks from Homer’s epoch found off the coast of Turkey. The section devoted to underwater archaeology in Poland presents the largest achievements of the National Maritime Museum’s research team - “Miedziowca” a merchant ship from the fifteenth century, exploration of the Swedish warship “Solena” from the seventeenth century and the English wreck from the eighteenth century “General Carlton of Withby”. The youngest branch of the museum - the Maritime Culture Centre located next to the Crane is the only educational facility in Poland and one of the most modern facilities in Europe, which in an interactive and multimedia way presents maritime issues (60 interactive stations presenting matters relating to shipbuilding, navigation, maritime technology, life at sea and underwater archaeology). It is an exciting adventure in science.